Earth tube concept and drawings slideshow, showing how to create an earth tube for natural heating and cooling without electricity at Mackinaw Mill Creek Camping. Select fresh air or to recirculate air. 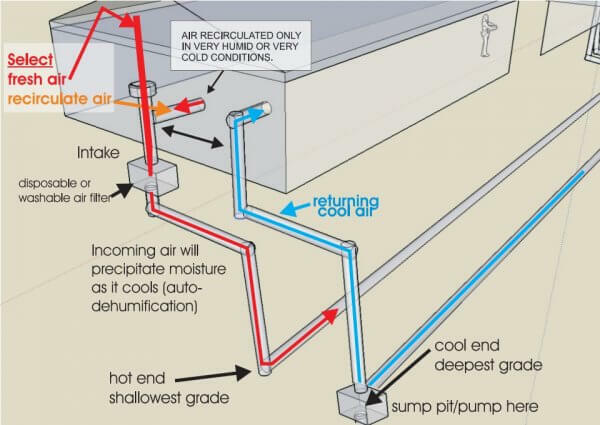 Air is recirculated only in very humid or very cold conditions. Use a disposable or washable air filter. Incoming air will precipitate moisture as it cools (auto-dehumidification). Separate intake and return as much as possible. Thermal Chimney's installed above insulation in attic. 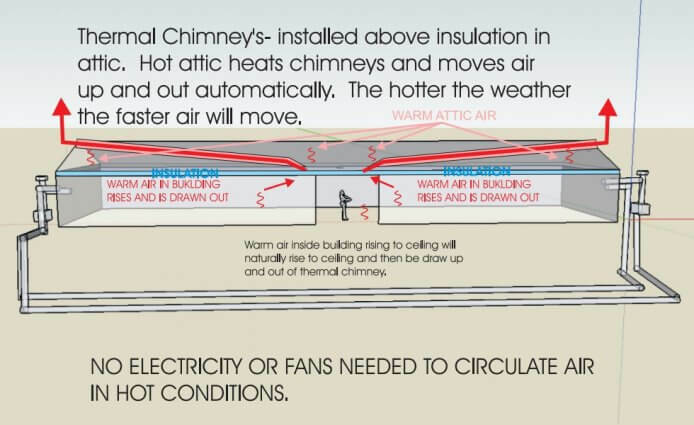 Hot attic heats chimneys and moves air up and out automatically. The hotter the weather, the faster the air will move. Warm air inside the building will naturally rise to the ceiling and then be drawn up and out of the thermal chimney. 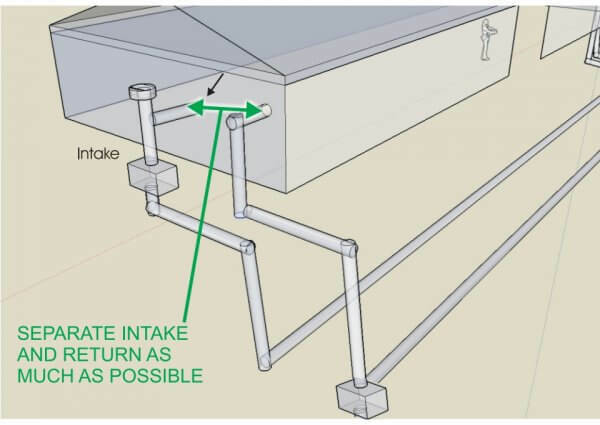 In cold conditions, close vents to prevent outside air from entering; recirculate inside air. Each half of the building will need to be relatively "sealed" so air will efficiently move through earth tubes and up and out thermal chimney. Doors weather-stripped, with self closers; windows closed; outdoor vents on lower level closed. Fans would be needed whenever recirculating air is necessary. Install tubes with cable strung through inside, to allow attaching bleach soaked towel that can be drawn through to sterilize and prevent mold/mildew.